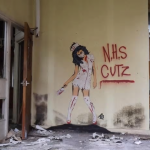 For most of the history of the NHS, graffiti has simply been a nuisance and a cleaning job. There is a reason a number of cleaning companies offer 'NHS discounts' on the hire of graffiti removal steam cleaners. 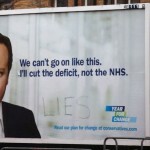 Yet, in the past decade or so, the relationship between graffiti and the NHS has changed. 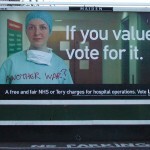 The 2005 and 2010 elections saw a number of campaign billboards, notably including those focusing on the health service, defaced with anti-government messages. Satirical acts of graffiti vandalism were hardly new, but social media allowed for them to reach a wider than local audience. 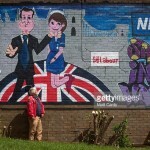 The years since have seen both major reforms to the NHS and the growth of the mainstream popularity of graffiti art, with street art referencing the NHS increasingly common. 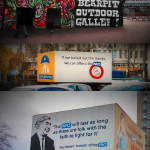 While there have been major commercial and corporate efforts to co-opt a necessarily subversive graffiti counter culture, the NHS and private companies such as Virgin Care have occasionally made a rather superficial attempt in the form of staff and patient feedback 'graffiti walls'. 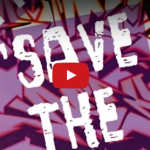 Pro-NHS campaigners have been more ready to adopt street art as a medium, with London artist Stik producing his Waiting Room in support of anti-reform campaigners at Homerton Hospital in 2011. In some cases this has used defence of the NHS as a focal point for opposition to Coalition and Conservative government policy, in others the NHS has been cast more as a symbol of the social democratic welfare state against the TTIP trade agreement and the wider neoliberal agenda. and private companies such as Virgin Care have occasionally made a rather superficial attempt in the form of staff and patient feedback 'graffiti walls'. Pro-NHS campaigners have been more ready to adopt street art as a medium, with London artist Stik producing his Waiting Room in support of anti-reform campaigners at Homerton Hospital in 2011. 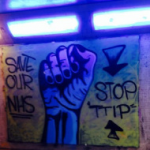 In some cases this has used defence of the NHS as a focal point for opposition to Coalition and Conservative government policy, in others the NHS has been cast more as a symbol of the social democratic welfare state against the TTIP trade agreement and the wider neoliberal agenda.